A mysterious plague of curses spreads across the infamous City of Adventure. When a small band of brave new heroes steps up to investigate, they find themselves facing a tide of insidious plots that promises the end of Freeport itself—at the hands of its ancient enemies. 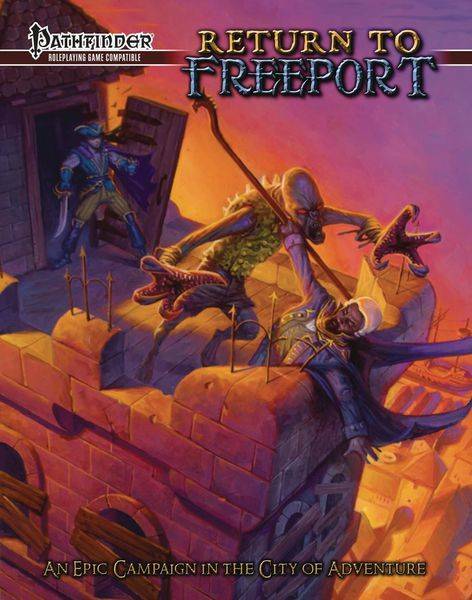 Six interconnected adventures crafted by veteran game designers and gathered here for the first time: Curse of the Brine Witch, by Patrick O'Duffy; The Abyssinial Chain, by Crystal Frasier; Storming the Razor Caves, by Stephen Radney-MacFarland; The Freebooter’s City, by Jody Macgregor; A Storm of Sails, by David N. Ross; and Traitor’s End by Jason Keeley. Full stat blocks for over forty new NPCs and monsters, including the dire prawn, fighting cockerel, and mermedusa. Deck plans and stats to give you full command of the Eth Abaddon, a mystical sailing ship driven by a powerful air elemental. Sidebars and handouts providing rumors, lore, and other important information to characters who possess Knowledge (Local) and/or seek to Gather Information. Simplified rules for naval combat, offering a streamlined option for ship-to-ship engagements.